Last week, terrorists wearing suicide vests stormed a Pakistani police academy in the southwest city of Quetta, killing at least 61 people and injuring over 100 others. The Islamic State claimed responsibility the following day. 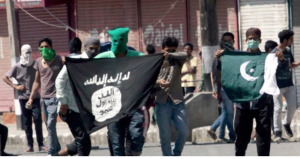 The Pakistani jihadist group Lashkar-e-Jhangv, or LeJ, traditionally linked to al Qaeda and the Pakistani Taliban, confirmed soon thereafter that it had cooperated with ISIS to carry out the assault. ISIS evidently has a presence in Pakistan–and one significant enough that established regional terror groups are willing to work with it. Here's the greatest threat that an ISIS presence in Pakistan poses, and it's one that policymakers should plan for now: the potential escalations that could follow a major terrorist attack on India, Pakistan's arch-foe. The aftermath of such an assault could have global consequences if both countries are not careful. An ISIS attack could happen anytime. The U.S. embassy in New Delhi issued a security warning on Tuesday to American citizens in India, cautioning them to be vigilant following media reports that ISIS may be planning attacks there. And the threat is not new: the American Media Institute obtained last year a 32-page Urdu-language ISIS document from Pakistan's lawless tribal lands. The document, which was reviewed by USA Today and verified as authentic by three U.S. intelligence officials, says that "preparations" are underway for a terrorist attack on India to trigger an apocalyptic conflict with America. "Attacking in India is the Holy Grail of South Asian jihadists," veteran CIA official Bruce Riedel told the American Media Institute at the time. India and Pakistan are bitter rivals with a history of military clashes and territorial disputes. The neighboring countries have gone to war four times since they gained independence in 1947 (each of which Pakistan initiated and India won), including as recently as 1999. What makes the situation more serious is that both countries have nuclear weapons. Pakistan allegedly possesses 110 to 130 nuclear warheads and India has 100 to 120 of its own, according to the Stockholm International Peace Research Institute. Pakistan's arsenal could expand significantly over the next decade, while India has the larger plutonium stockpile, giving New Delhi the long-term edge because of the chemical element's advantage over uranium in nuclear weapons development. Some may argue that nuclear deterrence could hold between India and Pakistan–which have populations of about 1.3 billion and 190 million, respectively. They might be right. But an examination of both countries' military doctrines should give one pause, because they lay the groundwork for an ISIS attack on India to trigger an escalation that could result in nuclear weapons being deployed. The Pakistani government, while fighting terrorist groups in some cases, has also allowed jihadists to operate within its borders, used terrorism as a tool of foreign policy, and trained militants to fight. Such actions have enraged India. For example, when Zakiur Rehman Lakhvi, the alleged mastermind of the 2008 Mumbai terror attacks, was released from a Pakistani jail on bail in April 2015, a spokesman for India's interior ministry called the court's decision "an insult to the victims of the 26/11 Mumbai attack." The massacre, which killed at least 164 people and wounded more than 300 others, was carried out by Lashkar-e-Taiba, an Islamic militant organization based in Pakistan that has reportedly been supported by Pakistan's Inter-Services Intelligence. India changed its military doctrine in recent years to respond more forcefully to attacks it believes are tied to Pakistan. Following the December 2001 terrorist assault on Indian Parliament and subsequent military standoff between both countries, New Delhi found it could not mobilize its forces quickly enough and was unable to utilize strategic surprise to its advantage. Therefore, India announced in April 2004 the development of a new offensive military doctrine known as Cold Start. It is a developed operational attack plan announced in 2004 and intended to be taken off the shelf and implemented within a 72-hour period during a crisis. Cold Start is not a plan for a comprehensive invasion and occupation of Pakistan. Instead, it calls for a rapid, time- and distance-limited penetration into Pakistani territory with the goal of quickly punishing Pakistan, possibly in response to a Pakistan-linked terrorist attack in India, without threatening the survival of the Pakistani state or provoking a nuclear response. Indian officials have denied the existence of a formal Cold Start strategy but have hinted at it. Analysts, however, have written extensively on the existence of such a doctrine. The bottom line: India has developed the capability, and possibly the intent, to launch a limited, blitzkrieg-style conventional military attack into Pakistan if it is hit with a significant enough terror attack that it believes Pakistan assisted. Pakistan's response has been to build low-yield tactical nuclear weapons. They are meant to be an asymmetric advantage to overcome India's conventional military superiority if Cold Start is put into action. Pakistan sees them as credible deterrents against Indian incursions because of their lower yield compared to strategic weapons. Moreover, tactical nuclear weapons offer, in the minds of Pakistani leaders, a way to ensure India cannot control escalation dominance if a crisis spirals into a conflict. To bolster its deterrence posture, Pakistan has refused to adopt a no-first use nuclear policy, unlike India–although New Delhi has said it would respond to a Pakistani nuclear attack with an overwhelming second strike. Pakistani Foreign Secretary Aizaz Chaudhary confirmed this strategy in October 2015, when he told reporters that Pakistan built tactical nuclear weapons in response to India's Cold Start doctrine and would use them if necessary. One could see how a Mumbai-like attack on India could trigger a Cold Start offensive, which in turn could trigger the use of a tactical nuclear weapon. If that happened, there would be no clear way to control escalation. It is troubling that ISIS worked with a Pakistani terrorist group, LeJ, which has been well established for two decades, to carry out the Quetta attack. That partnership likely formed because of LeJ's fervent anti-Shia bent, but ISIS could potentially work with other jihadist groups in the country. The more ISIS melds with existing terror networks, some of which are tolerated if not supported by parts of the Pakistani state, the easier it will be for India to say that Pakistan is behind an attack. The ongoing India-Pakistan rivalry is one that often gets little media attention in the Untied States, but we should remind ourselves there is only one region where two large, nuclear-armed countries border each other and are hostile. The presence of ISIS contributes nothing good to the situation. The next U.S. president would be wise to think about what he or she would say and do in the hours after a major ISIS attack on India.